Hey guys! How is your week going? Is is still crazy hot where you live, too? We overslept this morning, so I ended up not getting out the door for my run until around 10 AM this morning. Yes, I could have skipped since it was so late, but I’ve already missed a few days of running. I hate missing too many days, plus I needed to try a new app out that I promised I would post about on the blog. I knew as soon as I got out into the outside that this was not going to be a pleasant run. The sun was out in full force, and there isn’t a whole lot of shade near my house. I’m not going to complain too much though, because Winter will be here before you know it. I’ll take hot over freezing any day. Anyway, after a quick (and much needed) shower, I got to work in the kitchen preparing lunch for us. 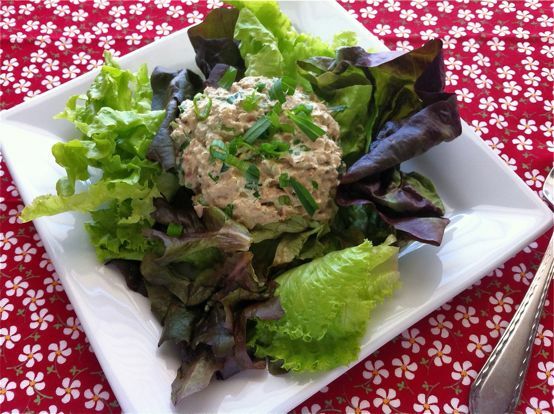 I mentioned before that I was working on a new tuna salad recipe. I made a few tweaks to the one I made this past weekend, and I think the recipe is really good! I used the the Mexican Mint Marigold (also known as Tagetes lucida & Texas Tarragon) that I picked up at the Farmers Market this past weekend in this recipe. 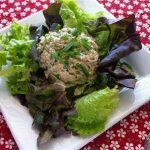 I wasn’t really sure that Mexican Mint Marigold Tuna Salad would sound appealing, so I went with Texas Tarragon Tuna Salad as the name. 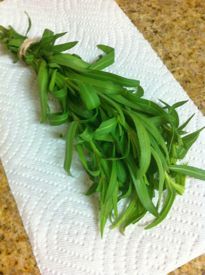 Apparently, Tarragon doesn’t grow really well here in the Texas heat, but this variety does. The lady at the Farmers Market told me that is commonly used as a Tarragon substitute, so you can either use the Mexican Mint Marigold or regular Tarragon in this recipe. This recipe calls for mayo, and although I know it would be much healthier if I made my own, I didn’t do that. Maybe one day I will make some, but that day wasn’t today. When I was at Whole Foods last week, I picked out what I thought was one of the healthiest ones on the shelf. The regular price for this is 6 bucks, but I did see that our store has it on sale for $4.99 this week. But hey, there is a reason that those other Frankenfood mayos cost less. 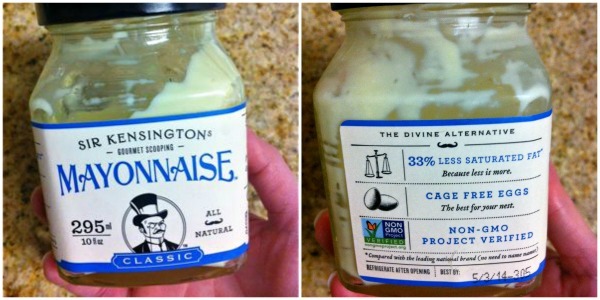 INGREDIENTS: Sunflower oil, egg yolks, water, lemon juice, white vinegar, salt, raw sugar, ground mustard seed, black pepper. Yes, the Sir Kensington Mayo does have some sugar in it, but I don’t think it’s a whole lot. Plus, this isn’t something we have 5 times a week, so we aren’t eating a ton of it. It’s just nice to have on hand for those times where I’m too tired to cook or just needing something really quick to make. I had some pre-washed petite lettuce leaves in the fridge from WF’s, which you are supposed to be able to use as wraps, but they didn’t work very well for that purpose. They weren’t sturdy enough. I’ll stick to the romaine lettuce leaves from now on. You can serve this in lettuce cups or whatever you prefer. Mix all ingredients together in a bowl until combined. Serve immediately or refrigerate until ready to serve.